Resident Evil returns to form with its weapons policy. For those that have played the classic entries in the Resident Evil series, you know that getting a new weapon could be tricky. Whether it was having to replace a shotgun hanging on the wall with a broken one, so a ceiling doesn't squash you or having to collect a plethora of keys to make it to the room containing a Magnum pistol, Resident Evil used to dole out its arsenal in doses. It seems Resident Evil 7: Biohazard is returning to that tradition. This means you'll more than likely spend your first hours having to run from enemies, but by the time you hit mid-late game you might get the satisfaction of taking the fight to them. 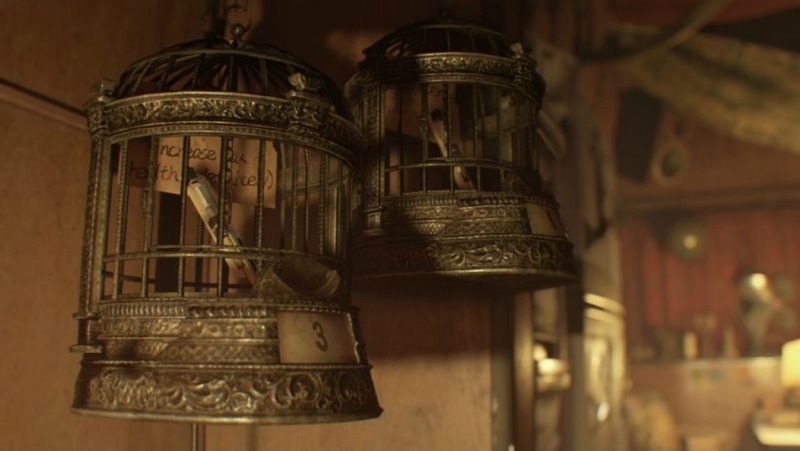 In this screenshot, you can see a health upgrade locked in a bird cage, and I can't wait to see what diabolical puzzles Capcom will have you solve to get the items you need to survive. Sounds cool, I really hope it turns out to be good so far I think it looks cool and sounds really promising.